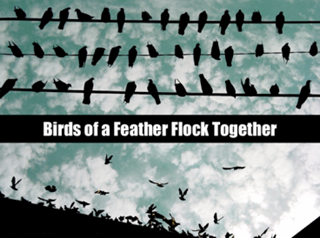 Birds of a Feather Flock Together – Who do You Surround Yourself with? I have always believed that a person is the product of their environment. For example, we know that a person who grew up in a township will not be like a person from the suburbs. And this is why I believe that even if our environments influence us, the people around us do most of the work. This goes without saying that if you think that you are not where you want to be, do not have the marks that you think you should be getting then you should change the things around you and the people around you. As my high school teacher used to tell me, ‘Birds of a feather flock together.’ So the real question is, who do you surround yourself with? This article is meant to help you as a student or as somebody who wants to achieve success identify certain characteristics and traits from people that will either make or break you. Those who don’t follow crowds- as we all know from the story of Noah’s Ark, Noah was the only person who did not sin. I bet that he was told that he was not cool enough and was heckled and teased. Despite this, he kept on going and he was the one that got saved during the floods. Which person do you know who always stays behind class to speak to the professor and even when the professor says he should speak to the TA, he tells him/her that he doesn’t pay the TA but pays the professor to pass? Who are those people who are never late nor who never skip a class? These are the people you should study and observe. Look at their habits and I bet you that these people are the best of the best – they are the cherry on top. Positive People- These are the people that you need in your life – the people who say you can when you think you have hit rock bottom, the people who have your back, those you know who want you to succeed and that will help you to do so. These are the people that you need in your life and they will be one of the reasons that you make it. These types of people that I have mentioned will help you with creating a good and can-do mindset in achieving your goals and more importantly in passing and doing well at your studies.